Chefs are moving away from towering food and swooshes of sauce on plates to a simpler, more elegant plating style. “It’s really about letting the dish and ingredients speak for themselves,” said Markus Glocker, executive chef of Bâtard in New York City. That means Glocker’s stuffed pasta with rabbit confit and carrot in saffron broth is a straightforward pile served in a contoured bowl. 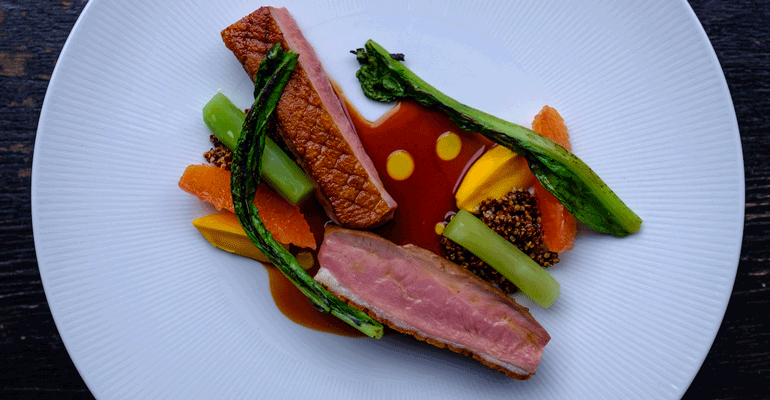 In another dish, Long Island duck is placed in the center of the plate, one piece on its side, the other upright, with bright vegetables and a small pool of cara cara orange sauce. “It should look very refined and elegant, but it should also look effortless, even if you have a lot of technique behind it,” Glocker said. Andrew Zimmerman, executive chef of Sepia and Proxi in Chicago, said the trend toward simple elegance has been a long time coming. Ultimately, everything on the plate should be there for a reason. “I like to think that whatever current plating trends are happening are in the service of a clean-looking, flavor-first mentality,” Zimmerman said. For instance, Sepia serves pan-roasted sturgeon in a red wine matelote, a French fish stew typically including bacon, onion and mushroom. The sturgeon is plated simply, with pan-roasted pearl onions, bacon and maitake mushrooms next to it. Zimmerman said button mushrooms would be more traditional, but maitakes are more beautiful. He also makes a reduction of fish fumet, demiglace and red wine, finished with butter. “I weave the sauce in and around the vegetables so that the vegetables aren’t coated in it, but the sauce is there and the vegetables are right on top of it,” Zimmerman said. The garnish is a few sprigs of chervil. “It’s simple and straightforward, but there’s a lot of work in there and it’s presented very elegantly, without too much crazy all over the place,” he said. While now falling out of favor, towering food on the plate actually had a purpose, according to Alfred Portale, chef and owner of Gotham Bar & Grill in New York City, and the creator of the style. “I prefer to refer to it as architectural plating,” said Portale, who has an interest in painting, drawing and sculpture, and originally planned to be a jewelry designer. Portale trained at high-end restaurants in France, where 30 cooks worked on a total of 60 dinners a night. When he opened Gotham 30 years ago, it was more like 15 cooks to 300 dinners. By stacking ingredients on top of each other — Swiss chard topped with roasted salmon, braised fennel and chervil, for instance — he accomplished that mission while also developing his own style, which was arguably the most copied of any modern chef. 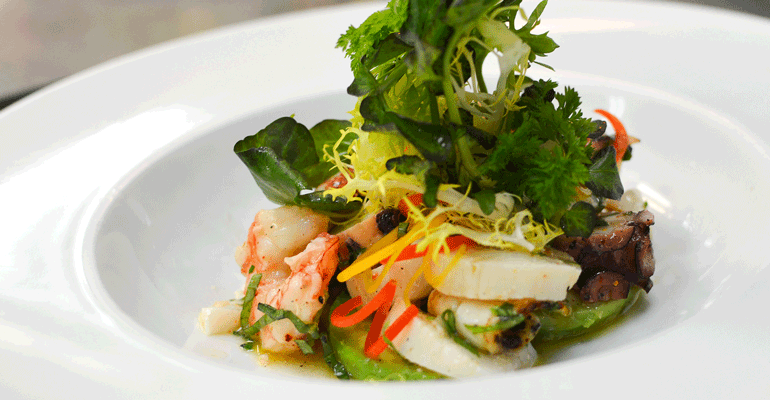 Gotham Bar & Grill’s menu has changed, but Portale’s signature seafood salad has been on the menu for 25 years. “For years it was this cone, basically, of seafood that stood about four inches tall, wrapped in a paper-thin slice of avocado. Coming out of the top was a bouquet of baby red and oak leaf lettuce and frisée,” he said. But even Portale is moving away from stacking. For example, one dish consists of poached Spanish octopus that is marinated, grilled, cut up and tossed with other ingredients, spread on a plate and garnished with greens. 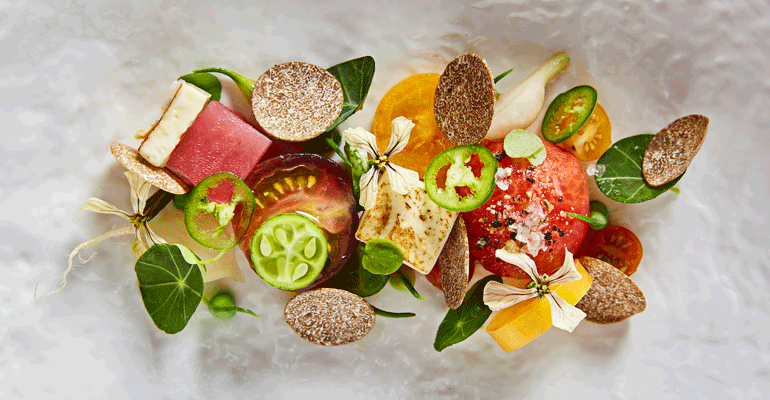 Jeremy Ford, chef of Stubborn Seed in Miami Beach, Fla., makes sure that every element in a dish has a purpose, a lesson he learned while working for chef Jean-Georges Vongerichten. That changed under the tutelage of the three-Michelin-star chef. Ford recalled a carrot dish that was brought together by a powder of dehydrated carrot and habanero, and citric acid. “It brought the whole dish together and, aesthetically, it was gorgeous,” he said. He surrounds the tuna with a variety of tomatoes, which are in season this time of year in South Florida. Some of them are raw, some are pickled, and some have been quickly blanched and their skin removed. For heat, the dish has sliced serrano chile and arugula flowers. He finishes the dish with heirloom beans. “It’s really kind of a throw on salad niçoise, if you will, minus the olives,” Ford said. He finishes the dish with Maldon sea salt and cracked pepper. A round, rough-textured plate contrasts the clean-looking tomatoes and tuna. At Sac-a-Lait in New Orleans, chefs Cody and Samantha Carroll draw inspiration from the farm country they grew up in. That’s not to say the food seems rustic. “We’re inspired by modern art and music,” he said. For a deviled crab dish, Carroll drew inspiration from his family’s camp in Grand Isle, La., on the Gulf of Mexico, as well as from the BP oil spill. The dish is plated with a crab shell emerging from “sand” (the deviled crab itself), made with crab, hard-boiled eggs and mayonnaise. 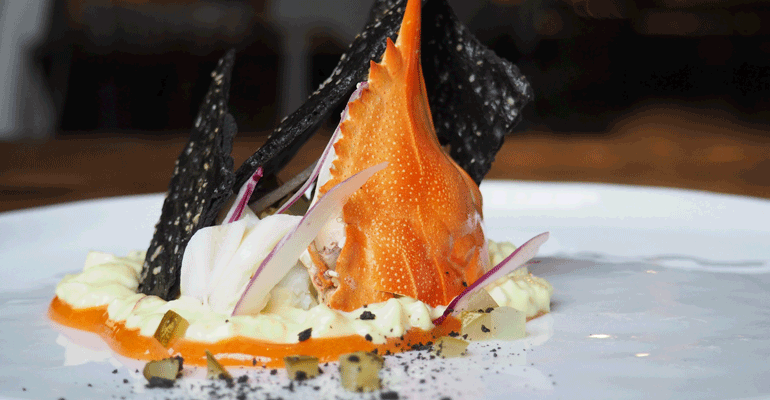 It’s garnished with black, jagged-edged cuttlefish saltines covering the crab. Samantha Carroll said an octopus court-bouillon is garnished with what looks like octopus tentacles in ink, but actually comes from a toy octopus hand. They used it to create their own stamps and use them to garnish the plate with a mixture of squid ink and honey. 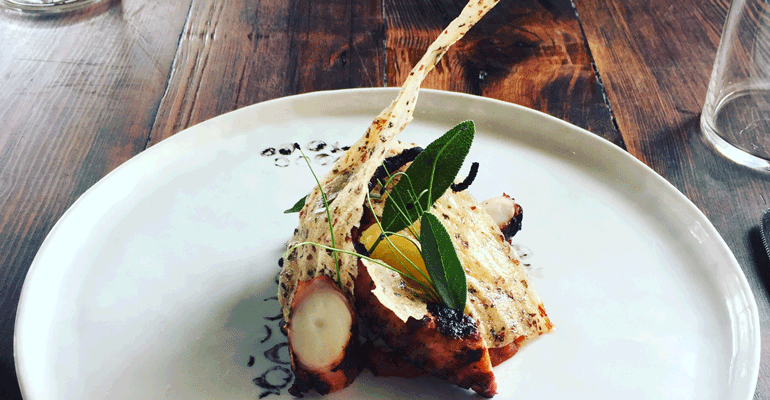 Actual octopus tentacles are charred and served over court-bouillon made with red wine and tomatoes. The dish is topped with spaghetti squash scented with lemon juice. Wild rice crisps containing flecks of black and dark brown “grow” out of the dish, along with Mexican tarragon from their garden. The natural aesthetic expressed in the Carrolls’ dishes has become more widespread thanks to the New Nordic culinary movement. Emerging from restaurants in the Nordic countries of Denmark, Sweden, Norway, Finland and Iceland — most notably Noma in Copenhagen — the movement focuses on using local ingredients and sustainable practices, and presenting food in a natural-looking state. “I don’t want my food to look like I’ve been with my hands too much in it,” said Gunnar Gislason, chef of Agern, a restaurant in New York City by Claus Meyer, who also owns Noma (that restaurant closed earlier this year but will reopen in a new form in 2018). “If I go out to eat and see on a plate that three chefs have been standing in the kitchen, coloring it for hours, it just doesn’t look that appealing to me,” Gislason said. 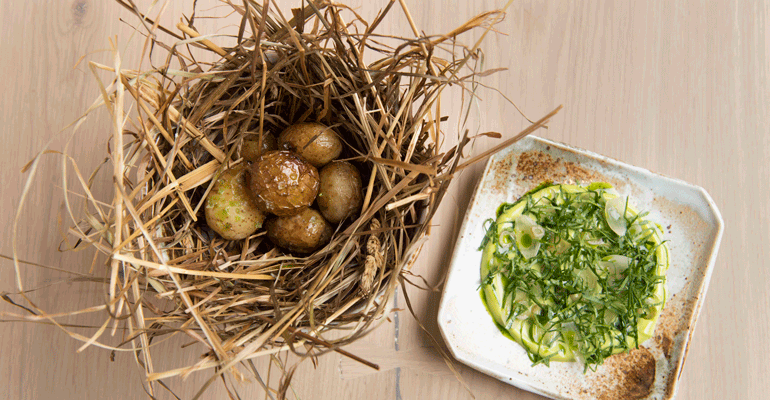 For one dish, he simply tosses potatoes in butter and puts them in a hotel pan with a lot of hay. He sets the hay on fire, covers it all and roasts it. “You get the flavors from the hay that burns and doesn’t bun, and we just serve them as is,” hay and all.